Buddy Rich is considered the best drummer to ever live. He was also a huge part of Jazz music in the 1950’s and 1960’s. His performance career began at the age of 18 months under the name of “Traps, the Drum Wonder” and from there his career took off. He was a well paid professional at the age of four, playing gigs on Broadway. His first move into the jazz world came when he was 18 and played behind Joe Marsala. Next was Bunny Berigan’s band where he played on the recording of “Serenade to a Savage” in 1939. He then moved on to Tommy Dorsey’s band where he met Frank Sinatra. He left the band to join the Marines and when he came back in 1944, he rejoined and can be heard on tracks like “The Minor Goes Muggin'”. He attempted a failed solo career, which led to him working with Charlie Ventura, and showing off his skills in the amazing drum solo of “Sugar Foot Stomp”. In 1950, he played with other jazz legends, Charlie Parker and Dizzy Gillespie on the album Bird and Diz. Although everyone knew him as an amazing drummer by now, he showed his great versatility on the 1955 album The Lionel Hampton, Art Tatum, Buddy Rich Trio which really showed off his skills with the brushes. 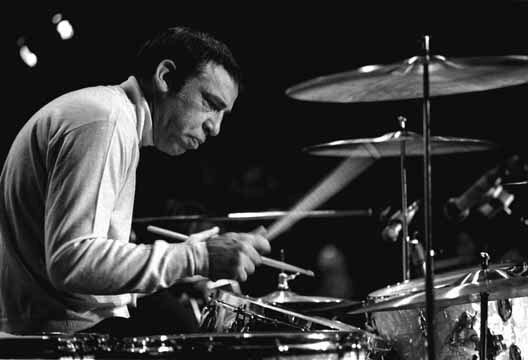 In 1966, Buddy Rich made another attempt at going solo, this time, it lasted all the way up until his death in 1987. This group played all over and had numerous hits, like “West Side Story Melody” from the 1966 album Swingin’ New Band, Live at the Chez where Rich played one of his best and most well known solos. His playing was also showcased in the fast tune “Channel One Suite” from the 1968 album Mercy, Mercy. Besides arranging some amazing music, Buddy Rich was a jazz drumming celebrity, becoming a regular on Johnny Carson’s Tonight Show. He also appeared on the Muppet Show where he had a drum battle with Animal as well as many other television spots. Buddy RIch did everything. He was a celebrity, a personality and an outstanding drummer, the best that ever lived.